Your Sales Funnel Strategist helping you attract more readers, engage more traffic and convert your subscribers into ideal clients and customers. "For the first time, I was able to get a true visual of how the entire automated system would bring in new sales. This was something I never really understood until speaking with Caressa." What happens when you get super specific and create a high-converting lead magnet (freebie)? Profit an additional $400 in $20 products. All within a course of 30-days! In as little as, 30 days! But it is dedicated WORK that you have to stay consistent at! 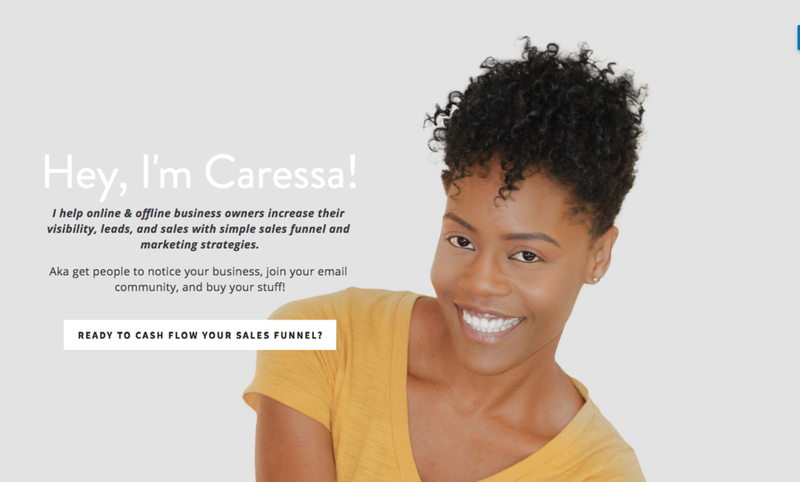 Hey, I'm Caressa & the Chief Funnel Officer behind CaressaLenae. My goal for you is to get more eyes on your content, engage those eyes into subscribers & convert those subscribers into clients & customers. Sonja, who consistently sell multiple quantities of her product a week. Or Darlene, who wrote her welcome sequence (thanks to my guidance) and sold her services in as little as 2 weeks. And Shannon, who finally engineered a sales funnel that had clients waiting to work with her. And before you know it, you'll have a full sales system selling your products and services on auto-pilot. I share these tweaks, systems, and processes with you almost daily via email and you can get in on the action. Click the button below and I'll even throw in a 9 steps checklist to gain more traffic, subscribers, clients & customers. Get Your Daily Dose Of Sales Strategies, Tips, & Resources To Start & Grow Your Passive Income Business!